Tuesday is CSA pickup day. 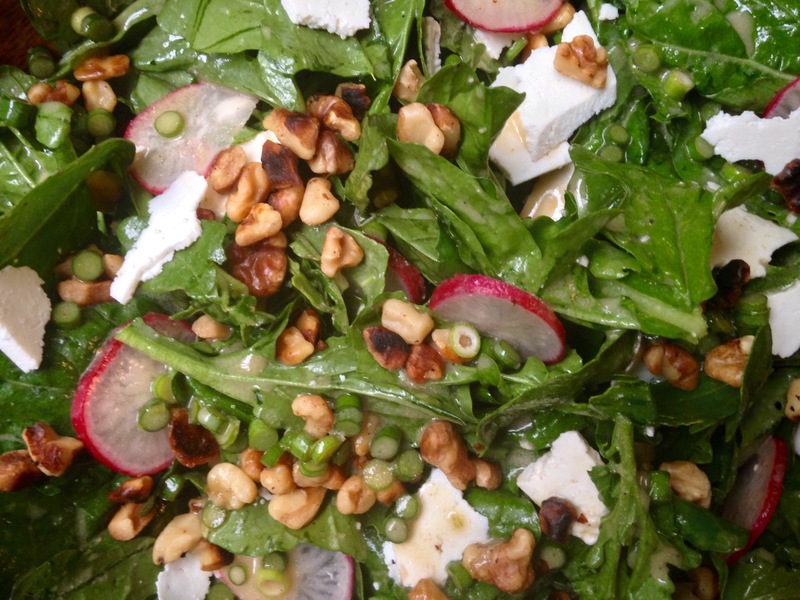 Farmer Fred excels at growing greens, so a big salad has become part of my weekly ritual. But, as the thermometer climbs, the delicate lettuces are giving way to more heat tolerant crops. This week brought iceberg, which should keep just fine in the salad spinner. Tonight’s haul also included the first of the sweet corn. Now this demanded to be eaten right away. Roughly chop the bacon, add to a cast iron skillet, and bring up to medium heat. Cook, stirring occasionally until bacon is mostly crisp and rendered. Set bacon aside on a paper towel. Chop and add the onion (but not the greens) and stir regularly until limp and somewhat translucent. Mince the jalapeño. Slice the corn niblets off and freeze the cobs for future chowder. Scoop the onions to the side, crank the heat up to high, and add the corn and jalapeños. Let sit for a few minutes until the corn starts to take on color. Stir and repeat a few times, mixing in the cooked onions as you go. Roughly chop the beet greens and thinly slice the onion greens. Add these and stir until just wilted. Season with salt and pepper. Add cilantro and crumbled bacon off the heat. At this point, you could just grab a fork and dig in. You could also serve it as a side with some fried chicken or even use it to top a salad. I opted to stuff some into a couple of corn tortillas and drizzle with some Tapatio hot sauce and a generous squeeze of lime. 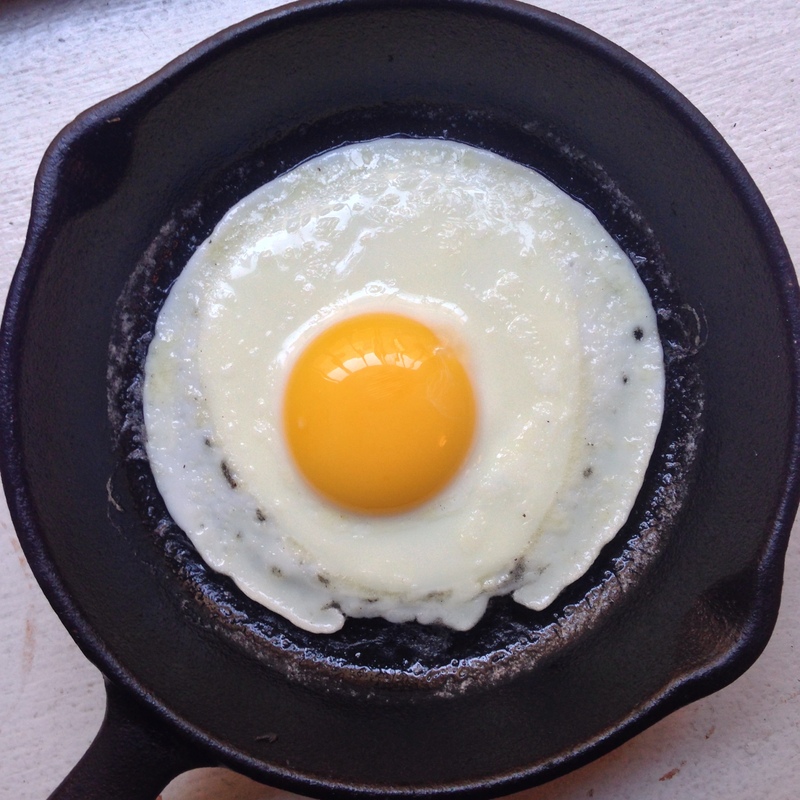 Fourth of July weekend I stumbled on a small, nicely-seasoned cast iron skillet in a junk shop up in the Catskills. The remaining corn, bacon and beet greens will make for a most excellent breakfast when topped with a perfectly fried egg. I spent this past weekend down in Baltimore, where the heat index was in the triple digits. Baltimoreans are a hardy lot. And so I joined them in a series of outdoor concerts, cookouts and stoopside dance parties. At some point I gave up on apologizing as another kiss landed on my glistening cheek. Best to focus my energies on hydration. Adequate sleep was not among the activities I managed to cram into my weekend. I dozed fitfully–my sweaty, sun-baked body lolling into the aisle as the Bolt But hurtled up I-95–and arrived home just in time to down some takeout before collapsing into bed. The temperature dropped a bit today, but my body has yet to catch up. What is ordinarily a 10-minute walk to pick up my CSA share took me nearly double. By the time I got home, bags laden with green vegetables, I had lost all ambition to cook. Luckily, Farmer Fred excels when it comes to lettuce and I still had the beets from last week’s share. The salad below came together in less time that it took to eat it. Whisk the first four ingredient together in a medium bowl and then slowly whisk in the olive oil. Finely chop the preserved lemon and add to the dressing. Using a mandoline, slice beets to 3/16″ thick. (If you don’t have a mandoline and your beets are small enough, a vegetable peeler will also do the trick.) 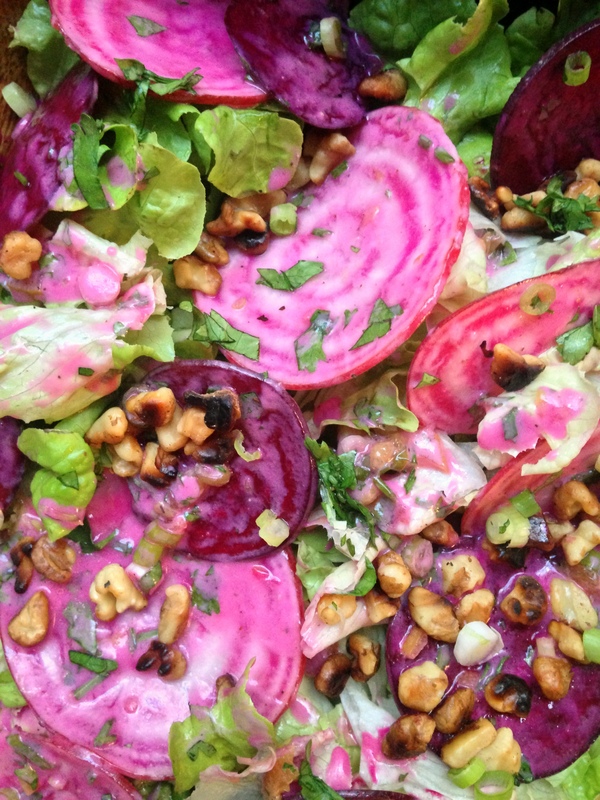 Toss the beets with your dressing and let sit. Toast the walnut pieces, stirring frequently, in a cast iron skillet over medium heat. Rinse and dry the lettuce. Thinly slice the scallions. 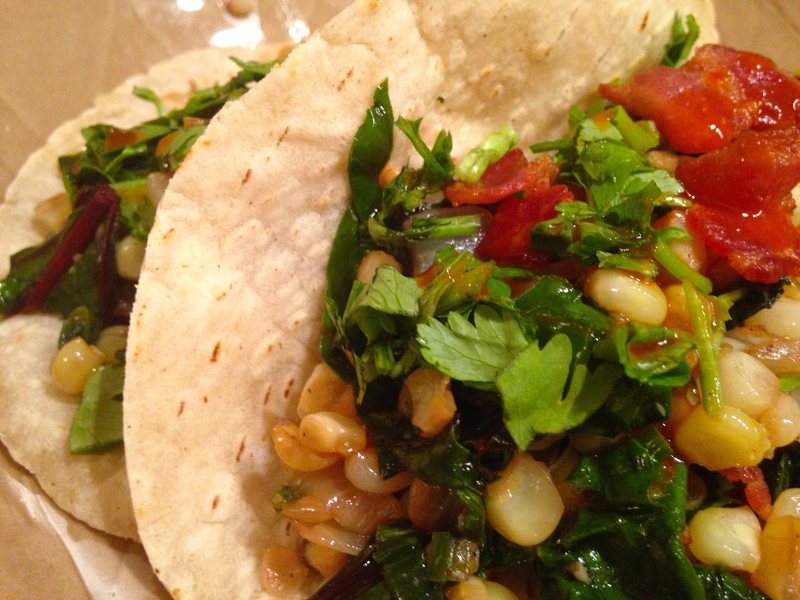 Mince the cilantro. Toss everything together in a salad bowl and grab yourself a fork. Rinse and dry the arugula you picked up in tonight’s CSA share. Toast some walnuts in a cast iron skillet. Thinly slice a radish or two. Shave and then crumble some Ricotta Salata. Whisk up a garlic scape vinaigrette. This is dinner without breaking a sweat, even when it’s 88 degrees and you’re too stubborn to turn on the AC.